We know that header and footer play an important role to make any website look professional. So in Zita, we have provided a lot of unique and useful header footer layouts with fully customizable options. Zita is one of the most lightweight theme available on WordPress which make it fast in performance. With our “Zita sites” plugin, browse lots of ready to use website. choose your favorite one and import it. Using live customizer you can change everything you want. No coding skill required. Zita is designed for page builders, Just use your favorite one and enjoy building websites. Useful for all type of businesses. We provide pre-made ready to use free and pro websites for all types of businesses (like Agency, Digital marketing, Charity, Jewellery store, Barbershop, Wine shop and many more). Websites can be imported with a single click using our Zita sites plugin. Three easy steps for creating your website. Creating a website is like slicing a butter. Download & install free version of Zita WordPress theme. Go to Dashboard > Appearance > Zita Options Or download from here and install importer plugin. After activating Zita theme and site library plugin go to the Dashboard > Appearance > Zita Site Library and import desired website. Zita is specially made for page builders. You can create a website using any of your favorite page builders. This setting provides full control over website width. You can adjust container width and select the desired layout for the whole website from a single location or for pages, blog/archive, blog single separately. Zita is fully loaded with header layouts, it contains 8 different header layout which will definitely help you to create your desired website. We understand that footer plays an important role in creating any website. So, we are providing 8 different column combinations, which will manage content in your way. You can change sidebar width and its alignment ( left, right no sidebar ) according to your website requirement. These settings can be modified for the whole website from a single location. As well as for page, blog, and archive individually. Theme contain blog page layout with four different column combinations. You can modify, hide and reorder post meta, post excerpt/content, pagination and featured image. All settings are available for post single page too. Use site preloader as well scrolls to top as per your need. Theme provides availability to use your own logo as a preloader. Create a beautiful store using Woocommerce. Zita plus Woo makes a perfect store. Adjust color & Typography as per your need. Theme provides full control over typography and color & backgrounds. 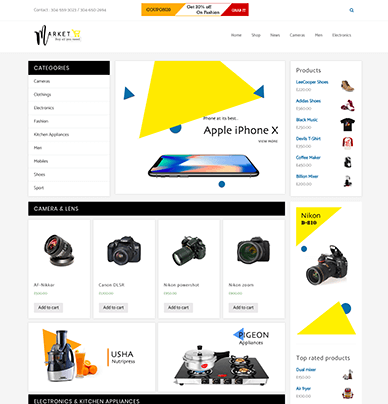 Theme contain full control over WooCommerce, You can customize woo store according to your need. Zita is coded with SEO friendly code, So search engine will love your site. Translate Zita in any language you want, using .po file. You can also create multilingual site. Zita is fully responsive, Your site look best in every media device. Zita + Woo-Commerce can transform your site in a perfect store. Any Query? our support forum is always ready to listen your query and resolve it. Zita is Free. Now & Forever. Zita Theme is totally free for Everyone. For extending it’s functionality . Go with Our ideal Packages. You agree with the storage of your data.